To soar high without a human getting off the ground. International Aerial Robotics Competition, AIAA Design-Build-Fly Challenge, and the AUVSI SUAS Challenge. 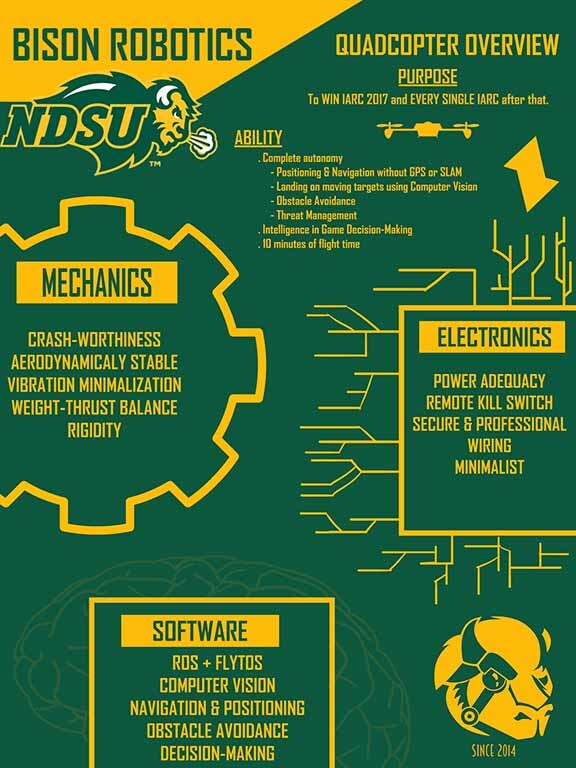 This team, in conjunction with the Computer Science Department and Dr. Jeremy Straub's guidance, is made to explore the world of sUAVs (Small Unmanned Aerial Vehicles, aka Drones). We seek to go beyond play, break through the boundaries of the industry, and solve problems that haven't been solved yet. Delve into the serious applications of sUAVs in the real world. As a general overview of the sUAV Industry. 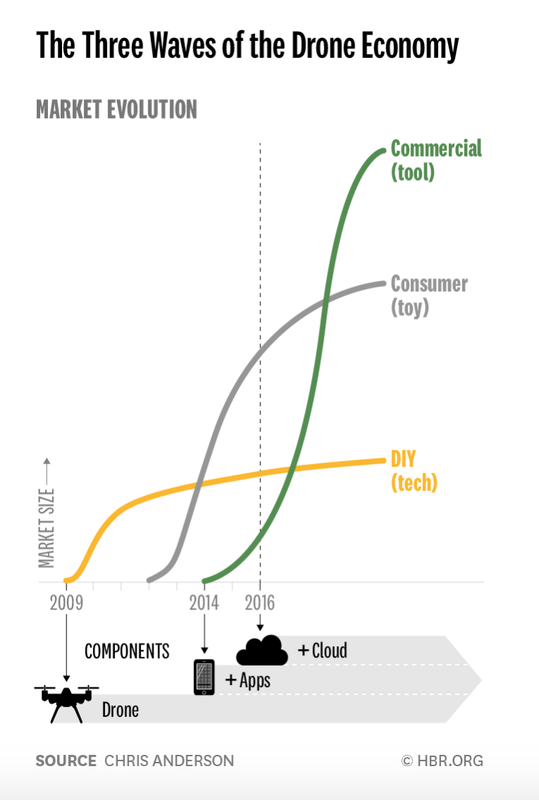 ​What started off as DIY and turned into a consumer toy has now taken on the commercial world. We can see sUAVs optimizing agriculture, performing construction surveillance, providing quality aerial imagery, taking on rescue missions, maneuvering in dangerous environments, and be taken as serious tech by consumers with the likes of DJI produce progressively smarter and cooler products. We, as the UAV team, seek to dive into this bursting industry and establishing our place in it as researchers and as its future engineers. ​The Quadcopter's primary purpose is to function autonomously in a non-deterministic environment given a primary objective to achieve. 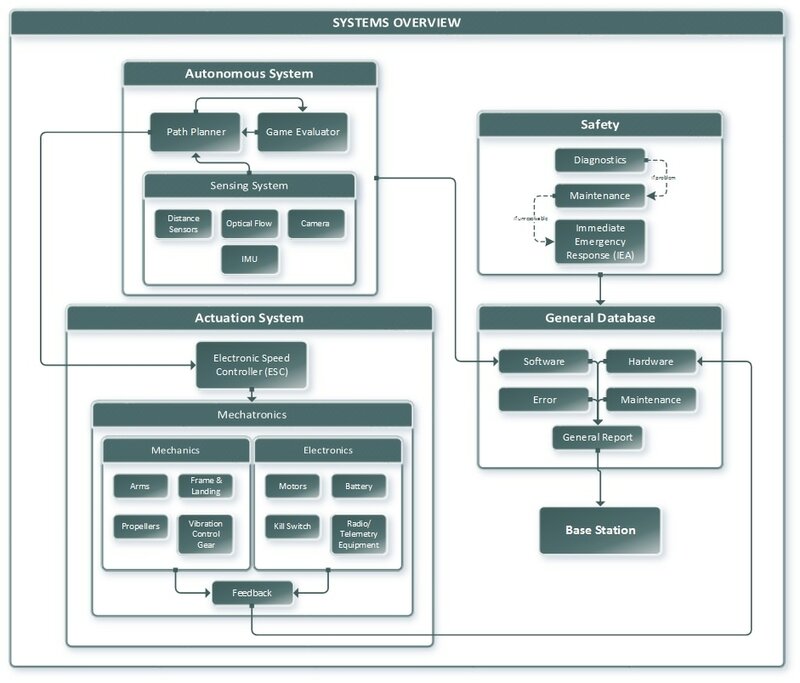 The below system architecture outlines the basic design principles our team developed in creating our UAV. The primary actors of the software system are the Autonomous System (AS) and the Flight Controller (FC). Taking an analogy here, the AS is essentially the brain and the FC its nerves. The AS is composed of the Sensing System, which inputs data into the Path Planner (PP) and the Game Evaluator (GE). The GE is the high-level intelligence aspect of the AS. It outlines the long-term mission that has to be completed and decides how best to complete that by defining several short-term missions. It also constantly evaluates the state of the UAV in the process of completing the mission and updates as needed to maintain the UAV at its optimal level. Furthermore, it would be the main interface between the UAV and anything that would communicate with it, be it a pilot, user, other UAV, and so on. Upon every evaluation, the GE communicates the appropriate information to the PP, that lines up the movement of the UAV to carry out the commands of the GE. It sets up Global Trajectories (the overall movement the UAV must take in completing its current mission) and Local Trajectories (the UAV's next immediate path, subject to constraints such as obstacles, PID, updates from the GE, system failures), and forwards that data off to the FC, which interprets the orders into motor motion. Along with this network, there is a Safety System (SS) that handles anomalies (any deviations from what is normal or expected) and system failures and a General Database (GD) that stores data on the software and hardware systems of the UAV, as well as information from the SS. The SS constantly scans the GD for anomalies (e.g., motor failure, something obstructing the UAV), and upon finding them, Diagnostics crosschecks them with a list of preloaded anomaly signatures and communicates the relevant information to Maintenance. Maintenance attempts to resolve the anomaly, and should it fail, it initiates Immediate Emergency Action protocol (IEA protocol), which is a series of steps to ensure safe shutdown of the UAV. In continuing to progress our software, we have implemented intelligence and machine learning algorithms and trained those systems repeatedly whenever such a thing would allow for improvements. We continue to optimize the algorithms used so that all computing may remain onboard and such that the UAV may be as real-time as possible. We have also kept in mind proper software engineering principles & practices and gone low-level with coding when desired. We shall continue pursuing perfection of our software system in such a manner. 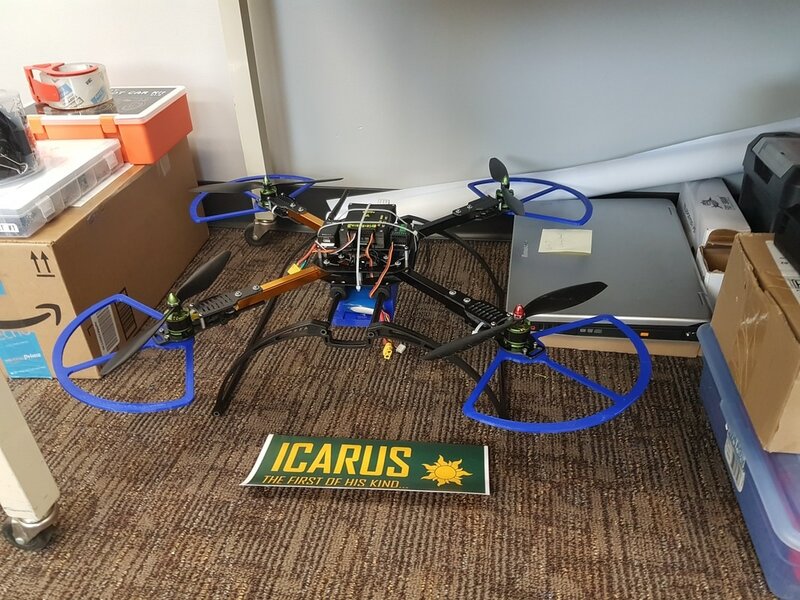 Aside from the software onboard the UAV, we have software running the Base Station, that displays data communicated from the UAV and has authority to manually override the UAV should the need arise as well as for testing purposes. The above paragraphs outlined a general system. For the IARC 2017 competition, we have specialized the systems to better carry out the required tasks. In our mechanical design, we have kept in mind two primary goals: Flight Dynamics and Risk Reduction. The weight distribution, positioning of parts, selection of frame, dimensions of components, materials used, making of guards & protective casings, and quality assurance were all accounted for in building the UAV, and many ideas continue to be thrown around and put in the team's to-do list for further improvements. Concerning the Electronics, a key goal was adequate power distribution for the expected mission at hand. Mission 7a allows up to 10 minutes flight time, and we intend to give ourselves the best chance at completing the task by ensuring we have at least 10 minutes worth of power. This meant selecting the largest Lithium Polymer battery our UAV could carry with appropriate accompanying motors, accounting for average current draw of the system. In general, we have also made sure to implement good engineering practices & principles.